Celebrations ended quickly for Ault. A defensive liability at first base, he lost his starting job in the very next year and within two years his big league career was over. He posted a career .236/.309/.362 with just 15 additional home runs—a far cry from the expectations following his 1977 debut. Ault spent another two years trying to resurrect his career before he turned a coaching job into a lengthy career as a minor league manager. While his baseball life might have succeeded, Ault’s personal life was in shambles. Failed marriages, financial hardship, and a prescription drug addiction led to devastating depression and tragic consequences. In 2004, three days before Christmas, Ault tragically took his own life in his own driveway. Douglas Reagan Ault was born on March 9, 1950, the third of five children (and first son) of Peter Powell Ault, Jr. and Florence Genevieve (Knight) Ault in Beaumont, Texas, 85 miles east of Houston. The Ault family traces its roots to central Texas in the mid-1870s when Doug’s grandfather farmed the rich soil southwest of Austin. Doug’s upbringing has been described as hardscrabble, and by all appearances so was his father’s. A middle school dropout, Peter left home at a young age and in 1930 the 17-year-old was living in Beaumont as a hotel bell hop. Ten years later he was a boarder living in the home of his future in-laws. Peter and Florence married during the war in 1943, and a year later they welcomed the arrival of their first child Brenda. For reasons unknown, Brenda appears to have served as caregiver for her younger siblings. Years later Doug credited her with introducing him to baseball and developing him into the rare left-handed throwing, right-handed hitting player he became.2 (Some evidence indicates he flirted with switch-hitting in his youth). The children attended French High School in Beaumont where Doug became a star pitcher and outfielder for the French Buffs. In 1968, a year after his father’s death from congenital heart disease, Doug graduated high school. He continued—most likely on an athletic scholarship—to Panola Community College in Carthage, Texas, 150 miles southeast of Dallas. Over the next two years the southpaw hurler compiled a record of 25-4 while batting over .400. Ault led the Panola Ponies to consecutive National Junior College Athletic Association World Series appearances, capturing the 1969 national title for the team while garnering individual honors as the Series’ MVP. Major league teams drafted him on three occasions during these years, but he chose not to sign. In the fall of 1970, Ault transferred to Texas Tech University in Lubbock. Shifted to first base, he continued his offensive onslaught by compiling a Red Raiders career record .418 batting average. In 1972, his senior year, Ault collected a conference leading 10 homers and led the nation with a .475 average to earn Southwest Conference Player of the Year and College Baseball All-America Team honors. The home run surge was a new bonus wrinkle after Ault gained weight and changed his swing following his junior year. In the summer, for the second straight season, he played for the Anchorage Glacier Pilots in the Alaska Baseball League and led the Pilots to the 1972 National Baseball Congress championship. The following spring Ault signed a free agent contract with the Texas Rangers and was assigned to the club’s Gastonia, North Carolina, affiliate in the Western Carolinas League (Class A). Now playing in the outfield, Ault got out of the gates quickly. Within the first weeks of the 1973 season, his .305 hitting trailed only his first base teammate Mike Hargrove. Compiling a league leading 19 homers and 88 RBIs, Ault earned All Star honors while leading Gastonia to a first place tie. In 1974, promoted to AA Pittsfield, Massachusetts in the Eastern League, he was joined by former Glacier Pilots teammate Roy Smalley. On June 24, Ault collected a triple, home run, and four RBIs in a 5-0 win against the Trois-Rivieres Aigles. Three weeks later he was responsible for all of the Pittsfield Rangers runs in a 3-0 win against the Thetford Mines Pirates. Jockeying between first base and the outfield, Ault finished the season with a .262/.333/.415 line while placing among the club leaders in nearly every offensive category. Ault played winter ball in Mexico in the northwestern city of Navajoa while awaiting his fate in the November 5, 1976, AL expansion draft. The Rangers first base job was securely in the hands of former Gastonia teammate Mike Hargrove, and the team’s large stable of promising outfielders effectively closed those positions off too. Ault was left unprotected, and the Blue Jays chose him with the 32nd pick of the draft. Ault’s selection hardly guaranteed a starting job, and when the Jays acquired veteran first baseman Ron Fairly from the Oakland Athletics on February 24, 1977, his chances appeared even dimmer. But Ault turned heads with three homers during a three day stretch in spring training and won the starting role. On April 7, snow showers and near freezing temperatures nearly postponed Ault’s Opening Day heroics in Toronto. Perhaps his experience playing in Alaska numbed Ault to the frigid conditions and enabled his superb debut performance. But more early rookie season heroics were to follow. On April 13, Ault’s sixth inning leadoff home run and two RBIs helped the Jays in a 7-6 come-from-behind win over the Detroit Tigers. Five days later, the less than fleet-footed Ault scored the winning run after stealing second base and coming around to score on the throwing error by New York Yankees catcher Thurman Munson. Within 24 hours Ault led the Jays to another win over the Bronx Bombers with three hits and three runs scored. On April 27, his three-run homer against righty Wayne Garland positioned the Jays to an eventual 6-5 extra-inning win over the Cleveland Indians. Ault finished the month among the AL leaders with a .342/.419/.592 line in 76 at bats. But not all went swimmingly for Ault. In June he committed five errors over a four-game span and finished with a near-league leading 16 errors at first. 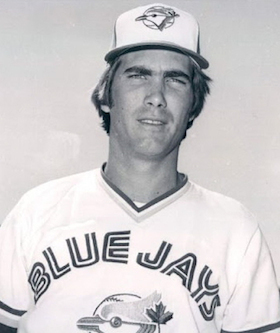 The miscues combined with a power outage of just one homer in 38 games prompted manager Roy Hartsfield to turn increasingly to others in the second half, including veteran Doug Rader whom the Jays acquired on June 8. Ault still finished among the team leaders with 109 hits, 22 doubles, 11 home runs, and a pace-setting 64 RBIs—a club rookie record that stood for 25 years. And though he earned a place on the Topps All Rookie team, October rumors surfaced that outfielder Otto Velez would be moved to first base in 1978. Indeed, while Ault spent another winter in the Mexican League, the Blue Jays were making plans to shore up the first base position. They acquired two first basemen, veteran Tom Hutton followed by slugger John Mayberry. Fifty games into the new season Ault had gotten just eight starting assignments, and only one of them at first as the club also experimented with him in the outfield. One of Ault’s few season highlights came on April 22 when his fourth inning leadoff homer proved the decisive run in a 4-2 win over the White Sox. He garnered just 12 at-bats in June and went hitless in 17 in July. Seemingly the forgotten man on the bench, Ault made only 54 appearances and collected just 104 at-bats for the season. In November he was assigned to the Syracuse Chiefs in the International League. For the next two seasons Ault was used almost exclusively in the Chiefs’ outfield. Except for a near team leading 12 home runs he struggled through much of the 1979 season. He carried an average under .225 through July that included a miserable 0-for-19 run. Finding his footing in August—.296-4-34 in his last 186 at-bats—Ault was sidelined for more than a week after he was struck on the left hand on a HBP. Fortunately his late surge carried into the next season. On May 5, 1980, Ault had a perfect 5-for-5 with a home run to lead the Chiefs to a 7-4 win against the Pawtucket Red Sox. More remarkable were his 10 homers and 51 RBIs in just 53 games. In June Ault was promoted to Toronto after outfielder Bob Bailor suffered a broken wrist on a pitched ball in an exhibition against the Chiefs. On June 18, 1980, following two pinch-hit appearances, Ault made his first major league appearance at first base in 21 months. He collected two hits, part of an 8-for-26 run that included two doubles and four RBIs in a June 30 outing against the Baltimore Orioles. Ault garnered six consecutive starting assignments at first base or DH before being relegated to the bench in the midst of a 1-for-24 plunge. In August, he made the most of four at-bats in Cleveland by clubbing three two-run homers. A month later he collected a triple and three singles in five at-bats against the Orioles. On October 5, in what was to be his final major league game, he pinch-hit in the fourth inning against the Boston Red Sox in Fenway Park. Remaining in the game, he drew a walk and a called third strike on two more plate appearances. Assigned to Syracuse for the 1981 season, Ault instead bolted overseas where he realized some success with the Hanshin Tigers in the Japan Central League. He spent another season in the Mexican League before signing with the 1982 Syracuse Chiefs as a player-coach. The latter experience ushered in a new career. During his playing career Ault had held a variety of offseason jobs, including work on offshore oil rigs. In the mid-1990s, he went to work as a car salesman in Texas. A decade earlier Ault married Texas native Julie Anne Pressler. The union produced two children before dissolving in divorce in 1990.8 That same year Ault became only the third Texas Tech Raider baseball player inducted into the university’s Athletic Hall of Honor. And about the same time Panola College’s Athletic Hall of Fame inducted him as well. Ault moved to Clearwater, Florida, to be closer to Toronto’s spring training site, where he again found work as a car salesman. He was a regular at Blue Jays’ alumni events. The author wishes to thank Rod Nelson, chair of the SABR Scouts Committee and Tom Schott for review and edit of the narrative. 1 Michael Clair, “Here’s how Jose Bautista’s Game 5 homer stacks up against 10 other historic Blue Jays blasts,” Accessed May 10, 2016, http://m.mlb.com/cutfour/2015/10/16/154520472. 2 From 1970-75 the AL had only three players who threw left-handed and hit right-handed: Ault, Rickey Henderson, and Kelvin Moore. 3 Despite his half-season stint in Pittsfield, Ault led the Rangers in home runs and RBIs. 4 “Rangers Shed No Tears for Grieve,” The Sporting News, October 9, 1976: 12. 5 “Woods Lights Fire for Blue Jay Hitters” & “Video Tapes Help Jays’ Ault Snap Out of Bat Skid,” ibid., May 28, August 27, 1977: 8, 13, respectively. 6 “A.L. : Toronto Blue Jays,” ibid., October 10, 1994: 47. 8 One report suggests his second child, a daughter, was the product of a separate relationship. 9 Mark Ulmer, “No Choice?” Toronto Sun, April 7, 2005, Accessed May 10, 2016, http://slam.canoe.com/Slam/Baseball/MLB/Toronto/2005/04/07/986237.html. 10 The Baseball Assistance Team was formed in 1986 by a group of former MLB players to confidentially help members of the baseball family who had nowhere else to turn. In 1991, MLB, the MLB Players Association, and the Gannett affiliated Freedom Foundation established an endowment for BAT with a one-time contribution. See Baseball Assistance Team, “What is B.A.T. ?” Accessed May 24, 2016, http://tinyurl.com/jat5npk.